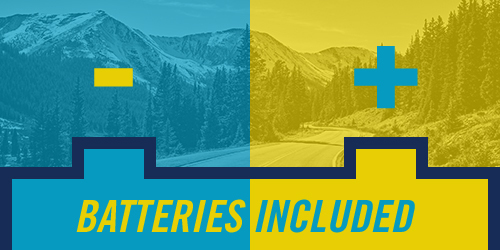 You live in Colorado, so, you need to keep your car charged and ready to go with a battery that's built to last. You do not want to get stranded on I-25 late at night with a dead battery. Routine maintenance and recognizing when something could be wrong with your car battery can be the difference between getting home safe at night or going through the unnecessary expense of a tow truck. The Service Department at Mountain States Toyota is here to guide you on how to choose the best battery for your vehicle, and answer any questions you may have about the care and maintenance of your car battery. We also have low and competitive prices on car batteries and battery parts. A cheap battery will last about 2 years, where a top-of-the-line battery can last up to 6 years (and sometimes more). However, the average lifespan for a car battery is 4 years. Mix 1 cup of very hot water with 1 tablespoon of baking soda. Using an old, but clean, toothbrush, dip it into the mixture and scrub the top of the battery. You do not need to disconnect the battery, and you will not get any electric shocks for using water. Clean around the terminals (where the cables are attached). If you want, you can loosen the cable and clean the connector (the metal end that attaches to the terminal. Also, called the clamp), and clean the entire terminal. Once the terminals are clean, make sure to rinse off all traces of the mixture from the battery, and reattached the connectors if you've taken them off. When you attempt to start the vehicle and the cranking of the engine (when you turn the key all the way) is sluggish and it takes longer than usual for the vehicle to start. In your dashboard display, the "Check Engine" light is on and/or the battery icon is on. You can see the battery fluids are low. The battery case is bloated and/or swollen. The battery is 4 years old or older. Terminal corrosion is caused when hydrogen gas in the acid in the battery is released and it mixes with ambient particles. If the corrosion is taking place on the negative terminal (usually the black wire), your battery is probably undercharging. And, the reverse would be true for the positive (or red) terminal. To clean corrosion, follow the same water/baking soda process explained earlier. First, you must understand that you cannot avoid corrosion 100 percent, but you can slow it down considerably. Once you finished cleaning the clamps and terminals, coat the terminals with high-pressure grease or wheel-bearing grease. Don't put too much, just make sure you cover the entire terminal. Additionally, there are aerosol spray coatings you can purchase at your favorite auto parts store. Ask one of our advisors, we can help you with this matter. If you jump-start your vehicle, and it soon dies, then the problem is with the alternator. The alternator charges the battery, and it also supplies power for your vehicle's electrical systems. If the alternator is damaged, then the car will stall because the battery cannot hold a full charge without the alternator. If you jump-start the vehicle and it continues running, then you turn it off and it doesn't start again, then most likely it is the battery. If the vehicle jump-starts well and it doesn't show signs it will stall, then the alternator is doing its job of keeping the battery going after the jumping. The technicians at the Service Center are here to make sure your vehicle runs as it should. Stop by for a battery test and drive confidently. Visit Mountain States Toyota Today - The technicians at the Service Center are here to make sure your vehicle runs as it should. Stop by for a battery test and drive confidently. **Price plus tax and shop supplies. Restrictions apply, see Mountain States Toyota for details. Offer valid on TrueStart and True2 batteries only. Offer excludes applicable tax. Not valid with other offer or advertised special. Installation extra. Excludes some hybrid vehicles. Excludes previous purchase. Toyota & Scion vehicles only. Offer available expires 03/31/19.